Total Quality Management s a conceptual term for driving the highest quality through the total development process and life cycle of a product. Total Quality Management term papers take a vast amount of time to outline and write. Here is a suggestion on how Paper Masters lays out an assignment like that. Total Quality Management, or TQM, is a conceptual term for driving the highest quality through the total development process and life cycle of a product. It has its roots in the Six Sigma strategy developed by Motorola, and promulgated by a host of CEO’s and consultants. Robert Galvin, former CEO of Motorola invented Six Sigma in the 1980s. Jack Welch, the CEO of GE quickly picked up the banner. Welch’s driving motivation was that “our quality stinks — the Japanese are coming, and we need to do something”. Johnson (2006) in his investigation of Six Sigma reports that while this paradigm carries with it a host of quality measures at its core Six Sigma is “a management strategy for quality and performance improvement that uses a metric of 3.4 defects per million opportunities as an anchor or guideline for performance. This metric provides a clear, focused and easily-understood standard for eliminating defects from work activities and communicating improved results”. Johnson goes on to report that this process provides the organization with the ability to create clear and definable goals that will reduce costs and improve quality standards. Other scholars examining a basic definition of Six Sigma report that Six Sigma has implications for operations in the entire organization. Specifically, Caulcutt reports that, Six Sigma is an information-driven methodology for reducing waste, increasing customer satisfaction and improving processes, with a focus on financially measurable results”. This author goes on to report that the Six Sigma framework provides the organization with the structure needed to improve operations in all levels of the organization. With this program in place continuous improvement becomes the central focus of all tasks and operations. The term “Six Sigma” comes from statistics. The Greek letter sigma is used to measure how far something deviates from perfection. Six Sigma means a company tries to make “error-free products 99.9997% of the time–a minuscule 3.4 errors per million opportunities”. TQM proponents maintain that poor quality costs money. Lost sales, lost goodwill, remedial activities to fix problems and downtime all add up to more in losses than the expense of producing higher quality management and products. These losses, proponents argue, detract from profitability, which translates into lower stock prices for the shareholders. The TQM program is initiated at the top levels, and infused throughout the organization to include every employee. Certain people in the management team get extensive training, and become “Black Belts,” implying top-level martial arts capabilities. Black Belts work on four projects a year, each targeted at saving $250,000. Other individuals attend less extensive training, and become “Green Belts.” Still others get “Yellow Belts.” When the strategy is implemented properly, one to three percent of a company’s employees and management will possess a Black Belt rating. Deming - Deming's philosophy on quality in business management research focuses primarily on the work process. William Glasser - The Quality School hinges on Glasser's previous work with the method of Control Theory. Product Liability - The system encourages better quality and safer products. Filing for an IPO - In this Filing for an IPO research paper assignment, you will choose and research a company that is filling for an IPO, and to evaluate the possibilities for financing the company’s growth strategies. Customer Service Standards - Customer Service Standards improve customer relationships and establish a standard behavior level for customer service. 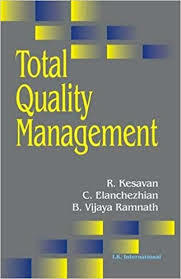 Paper Masters writes custom research papers on Total Quality Management and examines TQM in today's business world and beyond.